Equipment: cable TV; DVD, CD player, stereo; internet access Wi-Fi (included); washing machine; electric heating; underfloor heating (only in the bathroom/s); storage room. Furnishing: good, friendly, bright, laminate floor. Please note: Non-smoking house. detached house, 6 - 7 people, 5 room/s, 4 bedroom/s, 1 bathroom/s, approx. 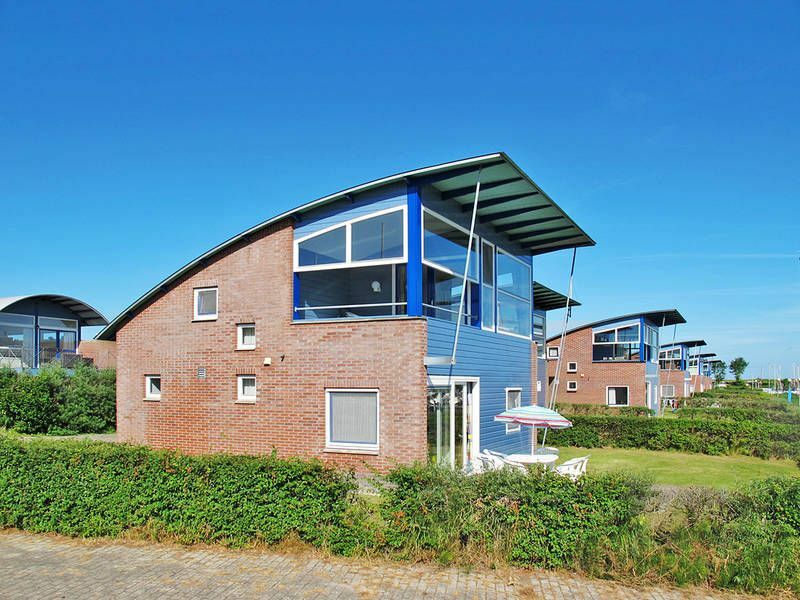 80 m², 2 floor/s, lake-view. Bedroom 1: (ground floor): 2 x single bed. Bedroom 2: (ground floor): bunk bed. Bedroom 3: (ground floor): bunk bed. Bedroom 4: (floor 1, roof pitch): 2 x single bed. Dining area: for 6 persons, in the kitchen. Important information: maximum occupancy 7 people. Kitchen: Kitchen/ cooking equipment: 4 ceramic hobs, oven, microwave oven, dish-washer, refrigerator, coffee machine, water boiler, toaster. separate (ground floor). Living room: (floor 1, roof pitch): furniture suite, exit to balcony. From the living room stairs to upper levels. Estate: (shared use with holiday guests): partially surrounded (fence), in a hillside, with plants, meadow. Bathing jetty / bathing: landing jetty (shared use) in approx. approx. 50 m.
Plot description: parking on the estate; parking near the house. private part of the estate, open plot, flat, lawn, meadow. terrace (partially roofed), balcony (roofed), furnishing provided, sunshade. Arrival: Airport Amsterdam in approx. 120 km. Train station Buitenpost in approx. 20 km. Beach/waters: Arm of the sea (bathing possibility) in approx. 5 m - 300 m. Grassy beach in approx. 500 m.
Harbour/marina: Harbour/marina in approx. 20 m - 300 m (Oostmahorn). Next village/town: Center Anjum in approx. 3 km. Dokkum in approx. 14 km. Groningen in approx. 40 km. Public swimming pool: Indoor public swimming pool in approx. 14 km (Dokkum). Public outdoor swimming pool in approx. 30 km (Leek). Shopping: Next supermarket (Anjum) in approx. 3 km.